You'll be barking mad to miss out on this totally adorable game! 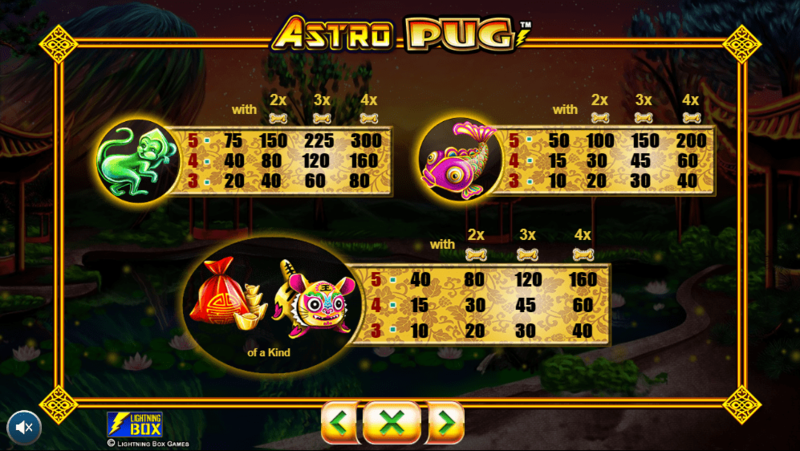 Lightning Box Games brings you Astro Pug, an orientally themed online gambling slots with a super cute and adorable pug twist. Astro Pug has 5 reels and 1296 ways to win system meaning that matching symbols are created when neighbouring symbols form starting from the left-hand side of the reel. The graphics in this slot are colourful, vibrant and adorable. There are some fun features too including bone multipliers, wilds and free spins. To add to the gaming experience, you'll notice that there is an upbeat Chinese soundtrack which helps you get into the zone. This extraordinary canine is just beckoning you to take him on an extraterrestrial walk. This Lightning Box Games slot has 5 reels with 1, 296 ways to win and a centre reel with a large 16-symbol Reelfacta. The design is nice and vibrant with incredible 3D graphics and a cool soundtrack to match. Behind the reels, you'll see an oriental landscape with tall trees, traditional Chinese buildings and a large blue lake. The symbols include multi-coloured card suit symbols, Chinese new year animals such as monkeys, fish and dogs, a bag of fortune cookies and a cute pug. Who wouldn't even want to play the best slots online with a cute pug in it? The Wild Symbol - The wild symbol in this slot is the pug. He only appears on reels 2, 3 and 4 and replaces all other symbols apart from the scatter. Bone Multiplier - The bone multiplier appears on reel 2 and can add either a 2x, 3x or a 4x multiplier to a win. Free Spins - Landing 5 or more scatter symbols will activate the free spins round. During this round, you'll be shown either a bomb or a pug. If you see a pug then you're in luck and will be awarded an extra spin. If you see a bomb then, unfortunately, the round will end. 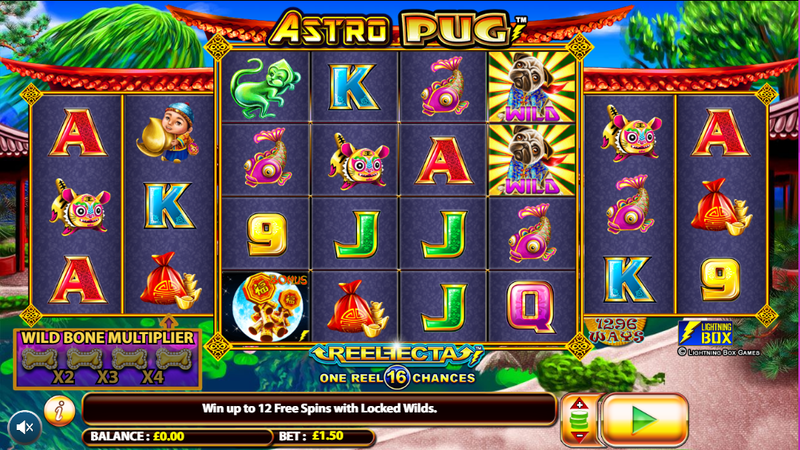 Astro Pug is a great casino slot games for those who love oriental themed slots or love cutesy animal games. The Reelfacta system provides a different gaming experience alongside the arguably unusual combination of themes. The free spins is perhaps the best feature as you can win the most here. Of course, the best thing about this slot is when the little pug pops up and makes a cute sound when you get a big win. If you enjoyed this slot game, why not try Sumo Spins?